So nu, what's the miracle? We all know the story: a little bit of oil, lasting for 8 days -- it's a neis, a miracle! And thus the obligation to place the menorah someplace visible from the outside, to fulfill Pirsum Nisa, publicizing the miraculous event. But there's a little problem, here on the first night. If there was a day's supply of oil, then what exactly is the miracle for the first day? A literalist might say, look, we're celebrating all eight days, so of course we have to start with the first day. A physicist might say, perhaps an eighth of the oil was consumed each day, so the in-progress miracle was already visible (similar to a derivation from the Beit Yosef). The midrashist might draw connections to the eight days of sukkot (though sukkot is really seven, plus shmini atzeret). Reasonable explanations, true; but not deeply satisfying. A Zionist or Maccaebean zealot might say, it's a different miracle that's being celebrated on the first day -- the nitzachon, the military victory. Although all traces of that perspective have been erased from the gemara and halachah, there's a germ of a different idea here. For an essential question behind any military undertaking is -- to put it baldly -- is God on our side? And how would we know? Most miracles don't even look like miracles. They're b'derekh teva, clothed in the appearance of the natural order of things. The crazy coincidences of the Purim megillah; the almost-slapstick but actually-heroics of Judith's Chanukah triumph; the impossible not-misses of meeting one's b'shert; the annoying red light that, unbeknownst to anyone, avoids the fatal car accident --no one is forced to see the hand of ha-Shem in these kinds of miracles. The hashgacha pratit is known only to the extent one wishes to know it. So perhaps the neis of this first night, is the neis b'derekh teva; the nisim that we are entirely immersed in, on all nights and at every moment. And the true neis is that, the more we become of aware of those miracles, the more obvious the miracles become, the brighter the light shines, throughout the eight days of the chanukiah, throughout this solstice-marking holiday, through the entire season of gradually increasing light, into the era when the light hidden away for the righteous becomes visible to all. In light of our economic tzuris, and the schanda of Bernard Madoff (the goneff), the mitzva of tzedakah is even more important than usual. Here is a note from Rabbi Ken Cohen, the Director of AU Hillel. In addition to the wonderful community-building programming at the Hillel, they also generously provide a sefer torah for Zoo Minyan's shabbos morning davenning. These are tough times, but the mission of American University Hillel to serve the needs of our students continues. But to be honest, I am very concerned. We are making cutbacks, but that may not be enough. 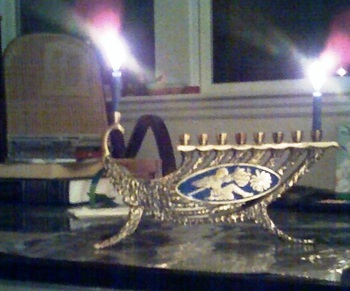 During the darkest part of winter, we Jews kindle a flame of hope by lighting menorahs. We chase away gloom, cold and fear with song and celebration. In a nutshell, stubborn hope has always been the key to our survival. Please support AU Hillel and make your 2008 tax-deductible gift now. December 31st is only days away. You can make your donation online through our website (www.auhillel.com/donate.htm) or send a check to the address listed there. AU Hillel receives no funding from American University and needs to raise approximately 80% of our own budget. Your gift, big or small, will help us continue to promote an extensive social, political and religious program benefiting all of AU’s 2100 Jewish students. Starting this shabbos: Zoo Minyan will now be ushering in the holy shabbos queen on a regular basis. Davenning leaders will be using our photocopied siddurim with egalitarian language (see the Guide for the Perplexed). Other siddurim will also be available, and everyone is welcome to daven from their own siddur. Certain kinds of cacophony / pluralism create their own harmony. We will have main courses from Siena's! Kosher, lots of dairy plus at least one non-dairy option, all veggie, and all yummy! Vegetable lasagna, eggplant parmesan -- send in your requests. If you're worried about whether you'll be able to eat at Zoo Minyan, there is always a critical mass of pot-luck contributions with a heksher or cooked in someone's heksher-only kitchen. There are always hekshered challot and grape juice. The entree is hekshered, and (for the l'mehadrin) heated while double-wrapped. And you'll get to know people as you ask who brought which dish. The Chanukah season always brings the same questions. What really went down 2,170 years ago? Where can I go to learn more? And will there be food? On the second night of Chanukah, we will answer all your questions when writer/producer Dave Smolar presents the fourth annual "Chanukah Seder," a full-length musical adaptation of the story with food, friends, and fun along the way. If you know everything or nothing about the holiday, if you just want to meet and greet in the city, if you want a Chanukah party where you actually celebrate Chanukah-- then come early, stay late, eat your weight in latkes, and be ready to sing along! Click here to register through the Jewish Study Center, for the flyer, or for videos from two years ago. We'll be gathering for davenning, lunch, shmoozing, singing, etc., this Saturday at Deborah and Shalom's house. Volunteers for leyning, leading, davenning treats, torah schlepping, and the famous Zoo Minyan veggies are very much appreciated – write back to info@ZooMinyan.org. Or use the self-service leyning spreadsheet to sign up. And next shabbos (Dec 19), we'll be meeting east of the park for Kabbalat Shabbat, dinner, more singing, etc. Details to come in next week's Zoo Mail. Final plans will be worked out next Tuesday evening – join in person or by conference call. Write back to Fridays@ZooMinyan.org – or check out our Google calendar and all sorts of other goodies here at our new website. Thanks go to all who have helped with polishing our Amidah text – now with fewer typos, all the seasonally-appropriate inserts, and (drum-roll please) a draft English translation. The latter will be handed out this shabbos for use during davenning, and then to take home for suggestions and improvements. As always, huge thanks go to Howard (yes, White) for making this project happen. We are thrilled to announce the official launch of the TransTorah website: www.transtorah.org! TransTorah's mission is to help people of all genders to fully access and transform Jewish tradition, and to help Jewish communities be welcoming sanctuaries for people of all genders. Our website offers links to many trans-friendly services and organizations, as well as a groundbreaking collection of trans and genderqueer resources. These include ritual, liturgy, sermons, and d'vrei torah (commentary on the torah), as well as educational materials and essays on gender diversity and judaism. Please note that TransTorah is a collective of like-minded individuals, not a non-profit or an organization. It is a labor of love that doesn't include little things like office furniture, staff, or IRS documentation. We would love to hear from you - especially if you do similar work and would like to be added to our referral list - however please be patient with us, as we may not be able to respond as quickly as we'd like. Thanks for your support and for sharing this resource with your communities. Tonight (Thursday night) is the fourth of December, a significant date on the Jewish calendar. Wait – the Jewish calendar doesn't have a "December"! Well, yes and no. And thereby hangs a tale. For a little less than half the year, we ask for rain in the “Blessing of the Year”, recited in the midst of each weekday Amidah. The timing mostly coincides with the rainy season in Israel. When the rainy season stops (at about Pesach), we stop asking for rain – we don't want to make a vain prayer. When the rainy season begins (around Sukkot)...well, it depends. In the Land of Israel, you really could start asking for rain during Sukkot. But who wants a wet sukkah? And who wants to ask ha-Shem for something that you don't really want? So we wait until everyone is done with Sukkot – measured as the time it takes for pilgrams to walk (or ride camels) from Jerusalem to the other side of the Euphrates river, also known as the 7th day of Cheshvan (this year, that was the 5th of November). Notice: that's a date in Cheshvan, in the Jewish calendar, because it's measured relative to the end of Sukkot. But the authors of the Talmud lived in Babylonia (ok, the authors of the Babylonian Talmud, but that's the one we all follow). The rainy season there starts later. And the time of year when it starts is measured by a solar calendar – relative to the fall equinox or winter solstice. In fact, the Talmud decrees that the rainy season (and the request for rain in the Amidah) for Babylonia begins 60 days after the fall equinox. That's not a fixed day in the Jewish lunar calendar. Hence we're marking the change in the Amidah as a date in December, not Cheshvan or Kislev. Now, hold on a second. We're in Washington DC, not Babylonia or the Land of Israel. When does our rainy season start? The halachic decision (after the Talmud) was to begin asking for rain at the beginning of the local rainy season (that's the quintessentially logical position of the ever-logical Rambam); or, especially in places that don't really have a rainy season, then to follow the default custom of the date used in Israel, the 7th of Cheshvan (for example, the Meiri and the Rosh). Oops. We don't seem to follow either of those two options. Instead, we pretend we're living in Babylonia? Does that make sense? Or to quote the Rambam on this issue, “Is this not falsehood and foolishness?” (Commentary on the Mishnah, Taanit ch. 1). So, as a practical matter, we start asking for rain on Thursday night, marking off the date in December. Even though it's an “astonishing tradition, difficult to comprehend.” But that only begs the question – for where does minhag (custom) come from? How does it get established? True, once established, it's hard to dislodge, and often not proper to dislodge. But if, by whatever mechanism, it does get dislodged, and a new minhag is established in it's place – does that new minhag also override halacha? Or perhaps the equivalent, does halachah morph to accommodate the newly established minhag? In a Kaplan-esque mode, can one engage in that process consciously, or can it only be determined to have happened in retrospect, usually after the passage of multiple generations? No answers here, sorry. But there are plenty of new minhagim being established at the Zoo. May those that are right and just be firmly planted.